The story behind MVB Sirenne is both amusing and long. In the 18th century, the Dutch controlled what is now Indonesia (the so-called “Spice Islands”) as a colony. 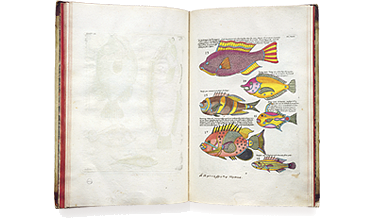 A Dutchman named Samuel Fallours, stationed on the island of Ambon, was busy making watercolors of local wildlife, mostly tropical fish. Because few Europeans had ever seen such incredible creatures depicted before, Fallours’ sketches were rather popular among the well-to-do, and he did well peddling copies of them. Of course, no one back home would be able to tell if Fallours was careful and accurate in documenting these creatures. While his triggerfish looks a lot like a triggerfish, he adds a smiling face on its side for effect. Some of his illustrations are pure fiction. It is therefore not surprising that he might include a hard-to-believe creature in his collection of illustrations, and have quite a story to tell about its capture. Fallours claimed to have observed a sirenne, or mermaid, in a tub of water in his home for four days, until it died. Hard to believe, yes, but Fallours, and a number of his colleagues documented his encounter in detail, including the sounds the mermaid made (it cried like a rat) and the form of its excrement (like that of a cat). It is possible Fallours made the whole thing up to enhance his notoriety. But both his story and his detailed drawing of the Sirenne, it appears, were accepted as fact. Meanwhile, back in Amsterdam, Louis Renard, a noted publisher of maps, published Poissons, Ecrevisses et Crabes, de Diverses Couleurs et Figures Extraordinaires (Fish, Crayfishes and Crabs, of Diverse Coloration and Extraordinary Form) in 1719, based on Fallours’ wonky illustrations. Renard included the mermaid in this natural history book, publishing Fallours’ story as fact. What does this have to do with a typeface? The artisan who engraved Renard’s book — likely a map engraver — had a distinctive style of lettering that was used on the descriptive captions for the many fishes (and mermaid) in Renard’s book. The plates used to print the illustrations were copper, the letterforms were hand-engraved (not a typeface). The engraved prints were then colored by hand. Those of us at MVB Fonts found the distinctive quirks of the roman letterforms and the eccentric stress of the italic interesting enough to embark on developing digital fonts based on the engraved samples. As the captions were hand-lettered, there was a great degree of variation, making a direct “revival” impossible, so Alan Dague-Greene interpreted the characteristics of the letterforms into a workable typeface design. The challenge was to retain a rustic quirkiness to the forms, yet have a typeface that was useful for more than display. The solution was to make optical sizes. The “Six” faces are full of character, but strong and open for clarity at small sizes. The design of the “Text” faces is more subtle, so that they can be used for passages of text, but retain the feel of their model. MVB Sirenne® “Eighteen” and “Seventy Two” are for display use. 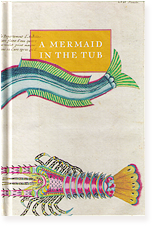 *A Mermaid in the Tub: the 40-page, full-color, hardcover specimen of MVB Sirenne® tells the long version of Fallours’ incredible story. It is mailed free of charge to those who purchase the complete MVB Sirenne Family package from MVB Fonts, while supplies last. A rare, 18th-century book published by Louis Renard was based on the work of Samuel Fallours and served as inspiration for the MVB Sirenne® typefaces. The engraving of what appears to be a triggerfish, from Renard’s Poissons, based on drawing by Fallours, includes a smiling face on the fish’s flank. Detail of an engraved caption from Renard’s Poissons. The many hand-lettered captions served as inspiration for the MVB Sirenne® typefaces.